Here is an interesting sheet for late war Spitfires. All are in the usual colors of Ocean Grey/Dark Green over Medium Sea Grey with yellow wing leading edge ID stripes. 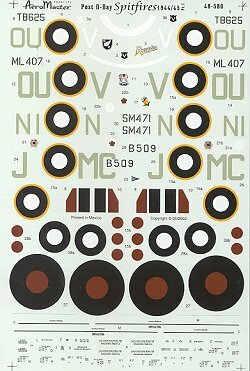 Ocidental, ICM, Hasegawa/Airfix and Tamiya Spitfires are recommended. 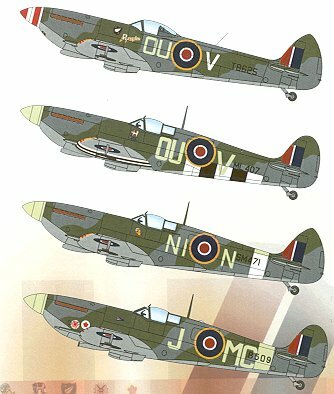 Basically if you have a specific Spitfire kit that matches the mark of the decals; use it. First up is a bubble-topped Spitfire XVI from 485 Sq in Germany during 1945. This clipped wing Spit has a red/white banded spinner. Though coded the same as the previous aircraft, this 485 Sq Spit IX has standard wing tips and D-Day stripes on the lower surfaces. According to the instructions, this plane got the first air to air victory on D-day, which doesn't match what I'm currently reading about the 10th PRG! From 451 Sq comes this clipped wing Spit XVI. It has a most unusual fuselage band that is white on the sides and bottom though the upper portion is the normal sky. Finally, the Wing CO's plane from 142 Wing as flown by John Milnes Checkets. This Spit Vc has clipped wings and no outer cannon stubs on the wings. It also has the later elevators and can also be done with full D-Day stripes should the modeler wish. There are enough insignia for two planes and enough data markings for one.